Datasheets - Typenblatt are available as follows. FuKW = Funkkraftwagen = Radio Car - Dedicated Radio Operator desk and chair with Telefunken FUG7b radios and tape machine. Power Generator, Telescopic mast, field telephones. This and TEL80 below are easily identfiable even if repainted as the cable flap on the LHS rear quarter panel is often still in place. The half panel version is easy to spot, not many Bay Window buses exist in this format. Useful Reference here with the links to the various types used by the German govenrment. We stick to the VW ones here though. 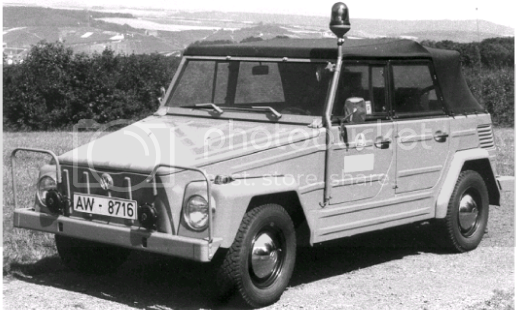 FüKW = Führungskraftwagen = Lead Technical Command Vehicle - Provided Communication (2m and 4m radios) local and trunk radio with field telephones, telescopic radio mast, mains power generator. TEL = Technische Einsatzleitung = Technical Operations Managment - These vehicles provide Technical Control Centre (communicaitons and planning with map desk and seating) for the Disaster Control Services (KatS). Note that this image, is used on the TEL85 datasheet and actually depicts the earlier TEL81, note the lack of lower front grille! The TEL85 looks externally the same as the TEL 81 except for the VW differences as the model changed from air to watercooled engines. ABC-ErkKW - T25/T3 Syncro 16" Prototype - Quantity Built = 1 - Converted by Brunn, Bonn. (The one and only!) There is a thread about this vehicle! ABC-ErkKW - 1994 T4 Syncro Prototype - Quantity Built = 1 - Converted by Brunn, Bonn(?? ), The Syncro thread also has this in it! All manuals are courtesy of BBK. Updated all of the datasheet links as the files had been moved since this was originally posted. Also added explanations of the group types and functions and sample pics from the datasheets to make identification of these types easier. Just checked these and the links are still live.